There has been much discussion of President Trump’s oft-quoted campaign pledge to “cancel the Paris Agreement,” especially this week, as masses descend on Washington for the People’s Climate March and the White House will soon decide the new U.S. position on the landmark international agreement addressing climate change. No one nation is technically able to cancel an international agreement, and the US can’t “cancel Paris” for other countries. 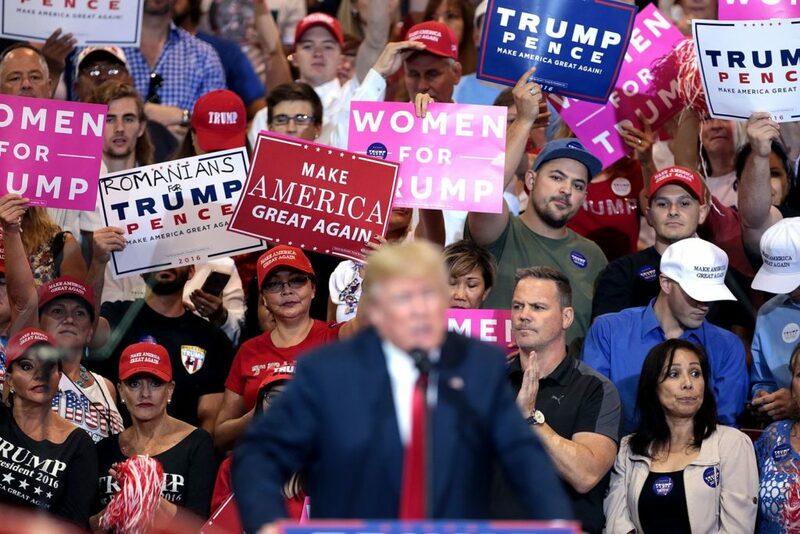 It’s unclear whether Trump actually intends to withdraw the U.S., change the existing U.S. target, or something else entirely, but even if he tried to keep his promise by de facto pulling the U.S. out, it would be enormously unpopular. U.S. voters overwhelmingly want to stay in the Paris Agreement, including about half of voters that supported Donald Trump in the 2016 election. The Paris Agreement is the first ever fully inclusive global climate agreement demanding action from developed and developing countries alike. The agreement, adopted by all 196 nations at the 21st Conference of the Parties (COP-21) to the United Nations Framework Convention on Climate Change (UNFCCC) in Paris in December 2015, sets up an architecture for all countries to take on greenhouse gas mitigation targets, report on their progress, and work together on adaptation to the impacts of climate change that are already impacting every community and every sector of the economy. It also compels countries to come back to the table every five years with revised or resubmitted greenhouse gas mitigation targets. All of this has the overall goal of keeping human caused global warming well below 2 degrees Celsius. The Paris Agreement also represents a marked success in the multilateral international system. Party nations to the UNFCCC have spent 25 years working toward a durable and inclusive way to confront the global climate challenge, and it has taken painstaking diplomatic efforts to secure a balanced deal under the measured and coalition-building leadership of President Obama, Secretary Kerry, and U.S. Special Envoy for Climate Change Todd Stern, among others. Climate diplomacy is one of the bedrocks of positive U.S. bilateral cooperation with the U.K., Germany, France, China, the EU, and other major economies and allies – all of whom are steadfastly committed to their targets. Our diplomatic standing in the world will be dramatically damaged if the U.S. were to walk back from the deal. To be clear, this was not a deal that came easily, and it has immense global and domestic support from governments, civil society, and the private sector. More than 150 of the largest U.S. corporations (even major oil companies) have affirmed their commitment to act on climate. These businesses have operations in all 50 states, represent more than $4.2 trillion in annual revenue, and have a combined market capitalization of over $7 trillion. While Trump could stop the U.S. from participating in the Paris Agreement, the American people feel otherwise. 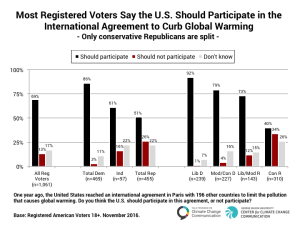 In a national poll conducted after the November election, registered American voters say, by a more than 5 to 1 margin, that the U.S. should participate in the Paris Agreement. Even if Trump could deliver on his campaign promise, it would be a very unpopular move that undermines our diplomatic relationships, and goes against views of his own Cabinet and the American electorate. Voters recognize the importance of following through on our agreements as a country. We aren’t a nation that goes back on our word, but if we don’t participate in the Paris Agreement, that’s exactly how world will see us. With so much at stake diplomatically, including our international standing and ability to work productively with other countries, and with a clearly aligned populace in favor of standing with the rest of the world to confront global climate change, it’s hard to ignore so many voices saying the same thing: the U.S. should stay in the Paris Agreement. Leiserowitz, A., Maibach, E., Roser-Renouf, C., Rosenthal, S., & Cutler, M. (2017). 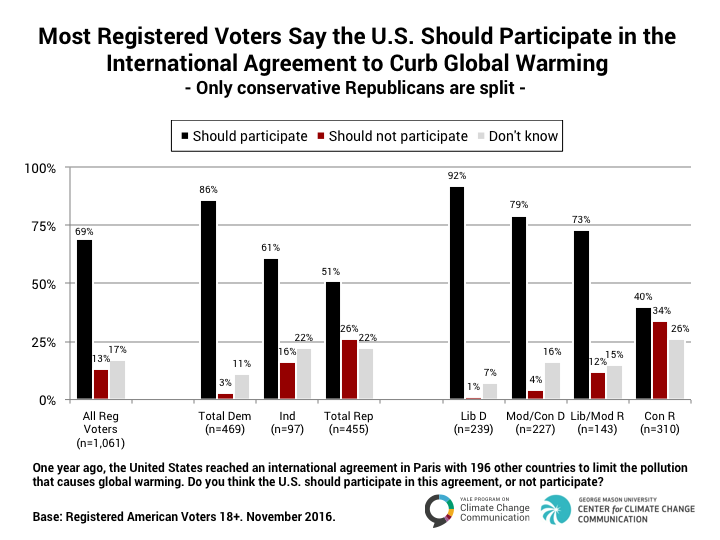 By more than 5 to 1, voters say the U.S. should participate in the Paris Climate Agreement.. Yale University and George Mason University. New Haven, CT: Yale Program on Climate Change Communication.